FK Lowry have successfully completed a £1.2M Bored Displacement Piling Project for IKEA’s new Greenwich Store in London. FK Lowry Piling were sub-contracted to McLaughlin & Harvey to install 1,700 No. 450mm Dia. Bored Displacement Piles to depths ranging from 11m to 15m to carry axial loads of up to 800kN. FK Lowry deployed their Soilmec SR-75 and SF-65 Piling Rigs to the 10 Week scheme. 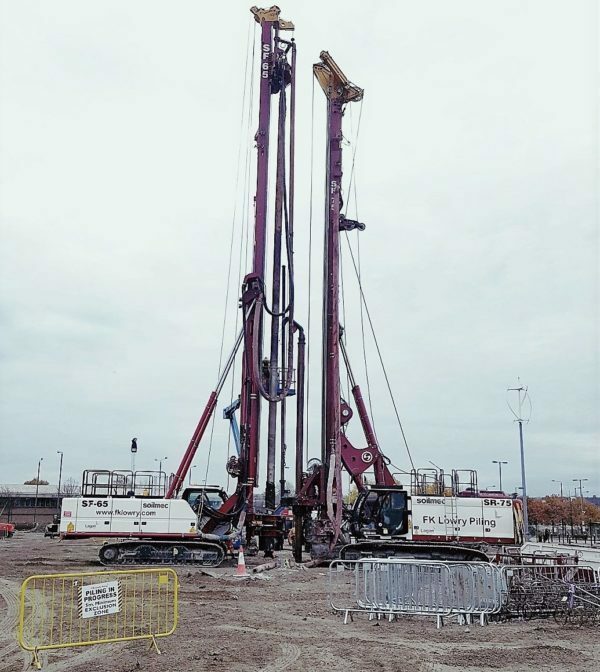 Contracts Manager Mr Sam Pyper explains, “Bored Displacement Piling was successfully used on the Ikea Scheme as they have the capability of providing high capacity, small diameter piles. The Bored Displacement system had the added advantage in that it generates significantly less “pile spoil” than other piling methods and lends itself well to the sustainable design running through the entire project. The Piling Technique is particularly relevant on “Brownfield” or “Contaminated” Sites were the cost of removing spoil is at a premium”. The new Store will be the leading sustainable store in the UK and has been designed with the local community, customer and environment in mind. This unique store will be set over two floors and feature rooftop pavilion, biodiversity garden, multifunctional spaces including numerous sustainable features and onsite renewable technologies.